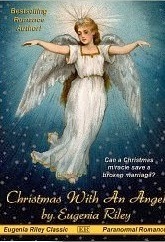 Another wonderful Christmas read from Eugenia Riley. I loved this book. It was such a sweet historical romance about a young couple who has never known love, but are given a second chance. The only catch is they have but one day to reconcile their marriage before Emily must move on to heaven. Can they find love in such a short time? The love that blossoms between the two characters is magical, but watching Nathan find himself in all the turmoil is even more magical. Such a lovely, lovely book. If you're looking for a heartwarming romance to read this holiday season, I highly recommend this novella. I was swept away to a different time and place while reading this gem and found it hard to put down.